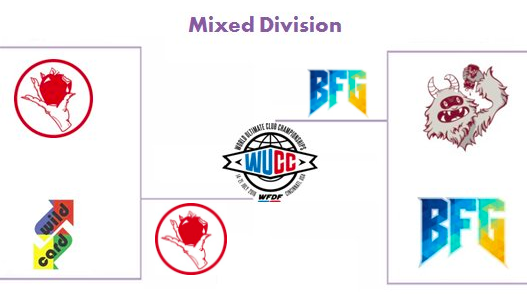 Seventy-two teams from 13 different countries are scheduled to compete at WFDF's 2018 World Masters Ultimate Club Championship (WMUCC) in Winnipeg, MB, Canada. Competition begins on July 29 and ends August 4. The host country, Canada, will be represented with the most masters division ultimate teams - 24. USA is second with 23 total teams across the 4 divisions. 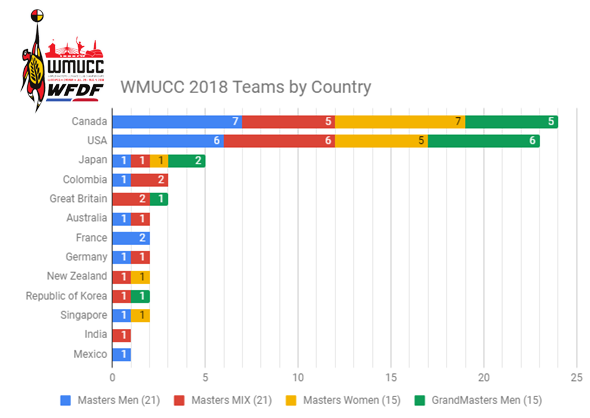 The Masters Men and Masters Mixed Divsions both have a total of 21 teams, while the Masters Women and Grand Masters Divisions have 15 teams each. 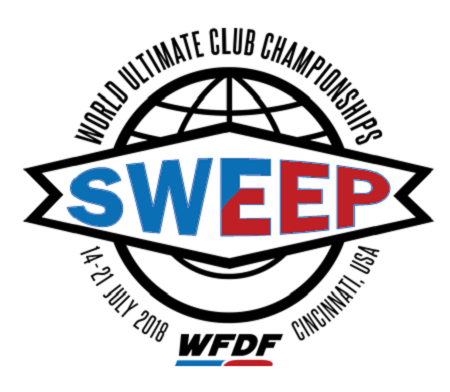 Club ultimate teams from the US swept gold at WFDF 2018 World Ultimate Club Championships - similar to past WUCC events hosted in the United States. 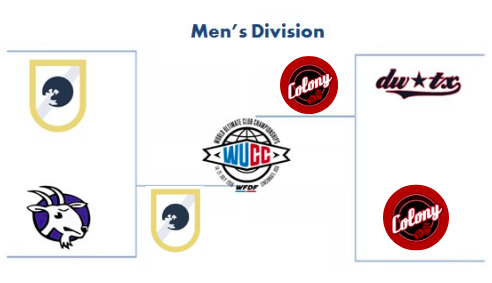 All U.S. club teams advanced to their division's quarterfinals at WUCC 2018. All US-based club teams combined for an impressive (109-13) win-loss record at WUCC 2018. Overall, 9 medals were won by U.S. club teams. 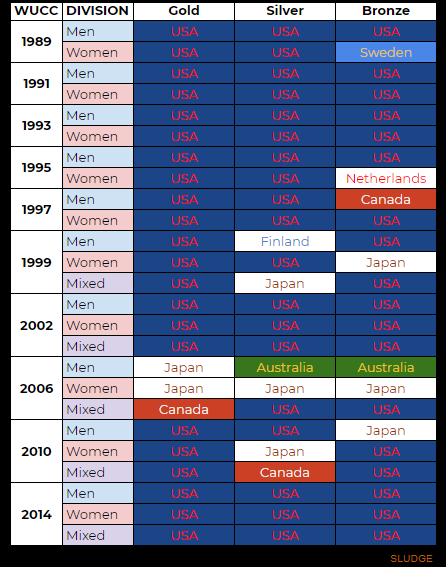 U.S. mixed teams won a record 4 competition medals, U.S. women's teams won 3 medals, and U.S. men's teams won 2 medals. More bronze medals were won at WUCC 2018 than previous WUCC events due to inclement weather preventing placement games in the final rounds. *did not originally qualify for WUCC. (27-1): combined record of U.S. club teams that previously did not qualify for WUCC 2018, including 3 medals - a gold, a silver, and a bronze. The US has won 9 medals at WUCC before - just not ever in this combination. 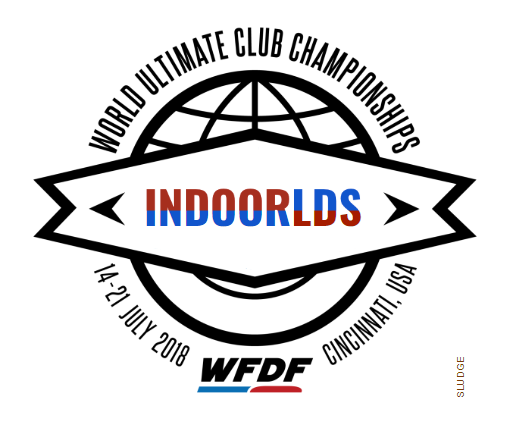 The World Ultimate Club Championships moved indoors to prevent inclement weather from drowning out the rest of the semifinals and finals of each division, leading to "Club Worlds" to be updated to Indoorlds. After an elongated-yet-shortened semifinals due to inclement weather, the championships for each division are set. 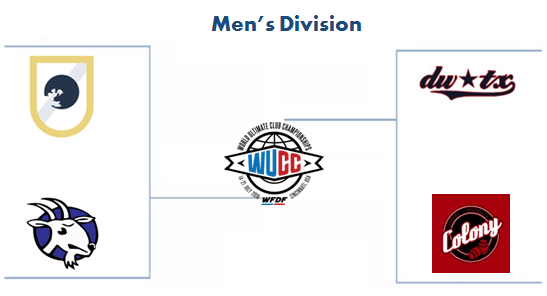 Watch the livestream of the division finals today (Saturday) at 8:30AM (Men), 2:30PM (Women), and 4:30PM (Mixed). Day 6 is done and 4 club ultimate teams in each division have advanced. 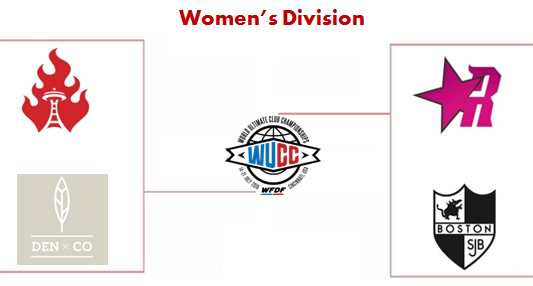 USA is represented the most with 9 club ultimate teams; Australia (M), Canada (M), and Colombia (W) each have 1 club ultimate team in the semis at the WFDF World Ultimate Club Championships. Semifinals are played on Friday, then finals on Saturday - watch live! [CORRECTION, 1:25PM: The group of players from Portland - organized by the women's club team Schwa - named the team competing against Cascades mixed squad. 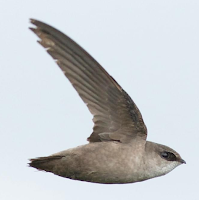 The Swifts have no affiliation with the to-be-named Portland AUDL franchise. Capitol Hill Seattle, who published the original article, has been asked to correct their online article. 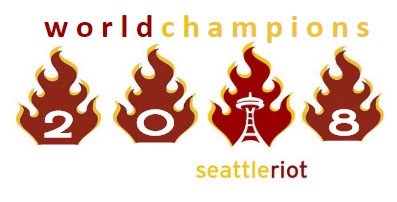 The Capitol Hill Seattle Blog broke news about the new AUDL team in Portland. The former Vancouver Riptide franchise will be known as the Swifts. 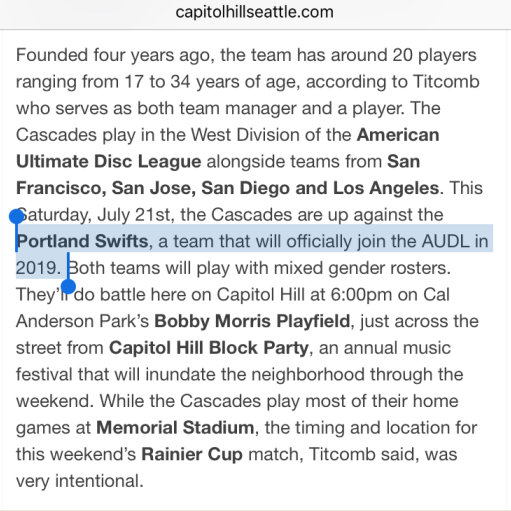 The Portland Swifts are planned to play in the AUDL West Division during the 2019 season. No formal announcement has yet been made by the Portland, Oregon team's ownership or the league. Day 5 at the 2018 World Ultimate Club Championships has concluded and each division's quarter-finalists have been decided. 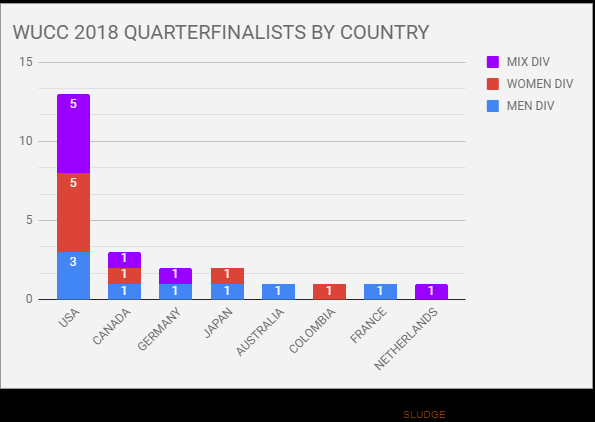 All countries represented by club ultimate teams in the quarter-finals had teams in every division except for the Netherlands—their only and only team (GRUT) advanced to the quarterfinals in the mixed division. With their loss on Saturday versus Pittsburgh, the Detroit Mechanix became the only American Ultimate Disc League team to be winless in the 2018 regular season. The Mechanix have now posted a record three winless regular seasons - in 2014, 2015, and again in 2018. The Detroit Mechanix end their 7th consecutive losing season with a -188 point differential, which averages to over 13-point per loss (13.42). 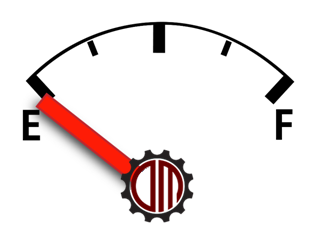 Detroit's biggest loss was a 29-point drubbing by Madison Radicals in May. Mechanix played 14 games in the Midwest Division during the 2018 AUDL regular season. Since 2012, the Detroit Mechanix have an dismal overall record of 16 wins and 86 losses (.157). 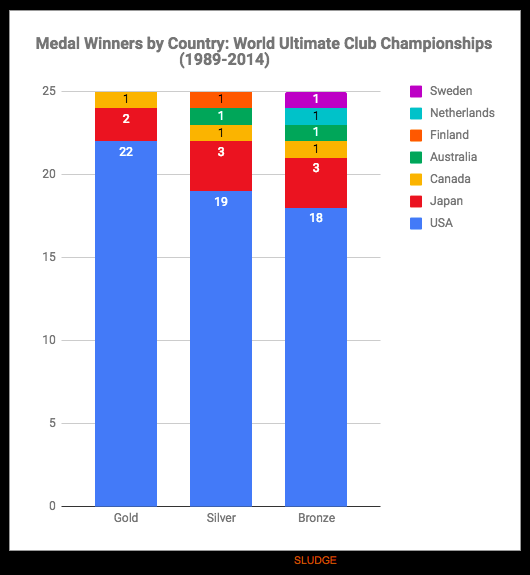 Club ultimate teams from the United States have won A LOT of medals at WFDF World Ultimate Club Championships. Overall, thirty-five (35) different US-based club teams have won a total of 59 medals at WUCC (1989 through 2014); below is the list. 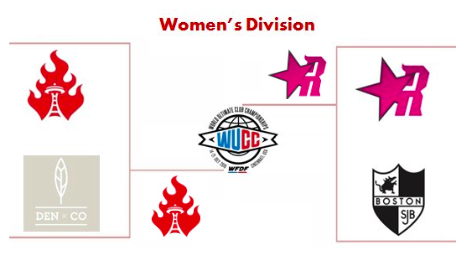 Women: Women on the Verge (3), Maine-iacs (2), Riot (2), Fury, Lady Condors. Which of these club teams from the USA will win at WUCC 2018 and be added to the list? 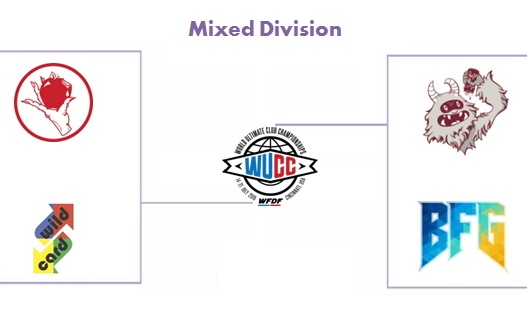 The WFDF 2018 World Ultimate Club Championships will collectively feature 128 teams from 36 countries in 3 divisions. Specifically, the men's division will feature 40 club teams from 25 different countries, the mixed division will feature 48 club teams from 26 different countries, and the women's division will feature 40 teams from 21 different countries. Competition begins on Saturday, July 14 in Warren County, Ohio. There have been ten (10) World Ultimate Club Championships hosted by WFDF. Since 1989 - when the first WUCC happened - seven (7) different countries representing club teams that have medaled at WUCC. 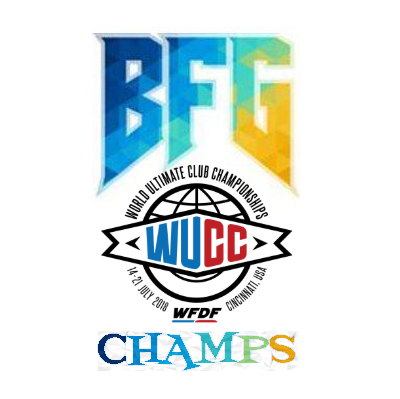 Club ultimate teams from the United States have absolutely dominated the WFDF World Ultimate Club Championships - collectively winning 59/75 (78.7%) available WUCC medals. USA club teams have won the most WUCC medals with fifty-nine (59). In second place, Japan club teams have collectively won 8 WUCC medals, next is Canada with three (3), followed by Australia with two (2), and tied with 1 medal is Finland, Netherlands, and Sweden. USA club ultimate team(s) have won medals at every WUCC. NOTES: More than one club team can represent a country. Compiled data excludes masters divisions/includes men's, mixed and women's divisions only. Data via WFDF; compilation and chart by SLUDGE.